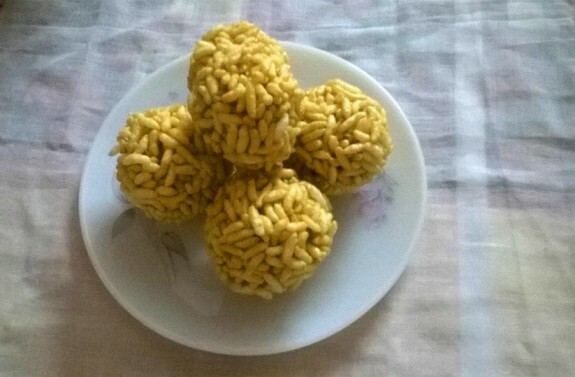 Murir Moa or Puffed Rice Balls is a sweet preparation from Bengal. During winter when nolen gur becomes available, Bengalis prepared this recipe. Explore our Bengali Recipes section for more Bengali recipes. 1. If the Muri is not so crisp, you can broil the puffed rice or muri in a cast iron skillet for about a minute to make them crisp. 2. Take a heavy bottom pan and add the jaggery and water and bring it to boil on medium heat. Stir it frequently and cook it for 10-12 mins until the jaggery syrup becomes sticky. To check it properly, you can pour a drop in the bowl of water and if it does not mix with the water and does not loose shape in the water, then the jaggery syrup is ready. 3. Turn of the heat and add the puffed rice and mix well with the syrup. Do not let the syrup cool down; otherwise it would not be possible to create balls or laddu. 4. Now apply little ghee to your both palms. Take a palm full of mixture and press gently to give the shape of ball. Do the same process for the remaining mixture. 5. Your Muri Moa is ready.